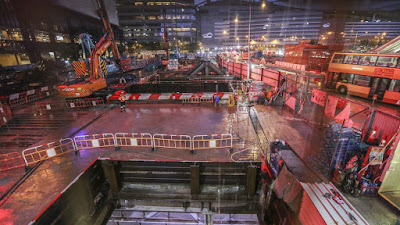 The Sha Tin-Central rail link debacle just got even worse -- construction around the Hong Kong Convention Centre in Wan Chai, one of the five stops along the line -- has halted because areas around the construction site are sinking beyond acceptable levels. On Friday the government ordered the MTR to stop construction because several points in the site have been sinking too much. "To east public concerns and under the principle of safety first, we think it is more appropriate to suspend all excavation work at the station," MTR Corporation managing director Jacob Kam Chak-pui said. According to media reports, internal documents from the company suggested unacceptable levels of subsidence have been reported in more than 14 areas in the construction site. He also insisted this did not mean there was any danger, but rather it was to ease the public's concerns, as well as giving the railway company to review and verify all the relevant data, and make nearby facilities safe, he said. 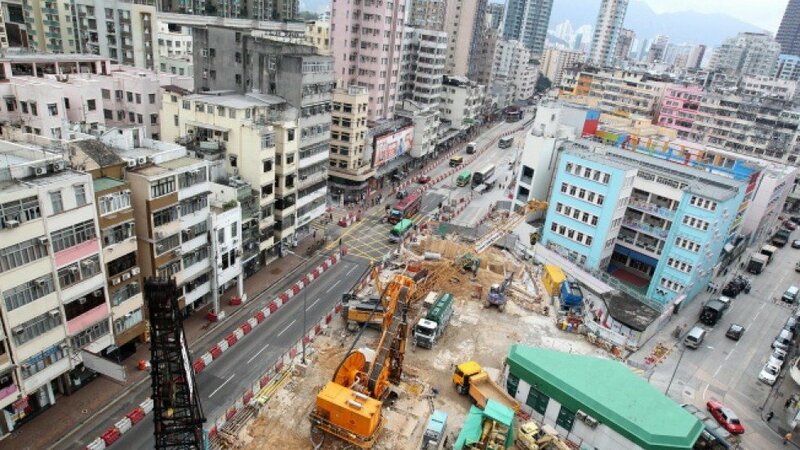 Kam would not say when the excavation work would start up again, or if the suspension would delay the opening of the HK$97.1 billion (US$12.3 billion) project. So far the Tai Wai to Hung Hom section of the new line is scheduled to be completed in mid-2019, and the cross-harbour part connecting to Admiralty is expected to be ready the following year. The public doesn't care anymore -- they want nothing to do with this line once it's completed because the line may not be safe, with metal rods not being installed properly to ensure the platform's ability to hold so much passenger weight, and now several cases of subsidence have showed up, not only in Tai Wai but also Tokwawan. However, the company insisted the situation in Tokwawan were not a public safety concern. The entire project is so badly constructed that no one is interested on riding this crucial rail link because of the many flaws in it, and yet so much money has been sunk into it and they can't even build it properly and safely. A few days ago four senior managers left the company with immediate effect, while the CEO Lincoln Leung will take early retirement. Hong Kong Chief Executive Carrie Lam Cheng Yuet-ngor says these executives won't get golden handshakes, but they have still lined their pockets with years of generous salaries. How is the MTR going to win back the public's trust when the company's tagline claims it is "Caring for life's journeys"?